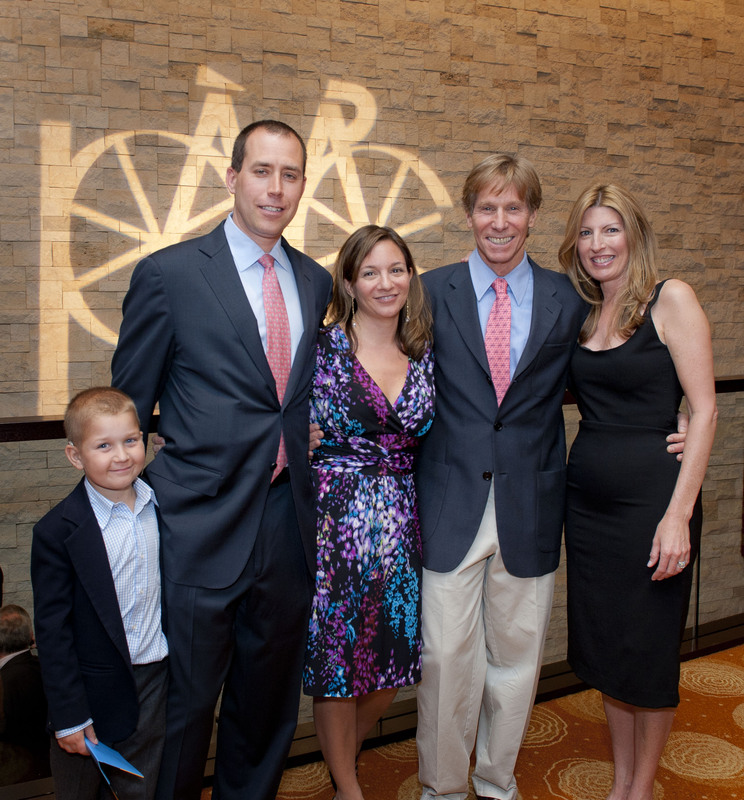 On Friday May 13, more than 600 top fundraisers gathered to celebrate the Pan-Massachusetts Challenge’s 2010 donation of $33 million to Dana-Farber Cancer Institute and to kickoff another milestone year ahead. 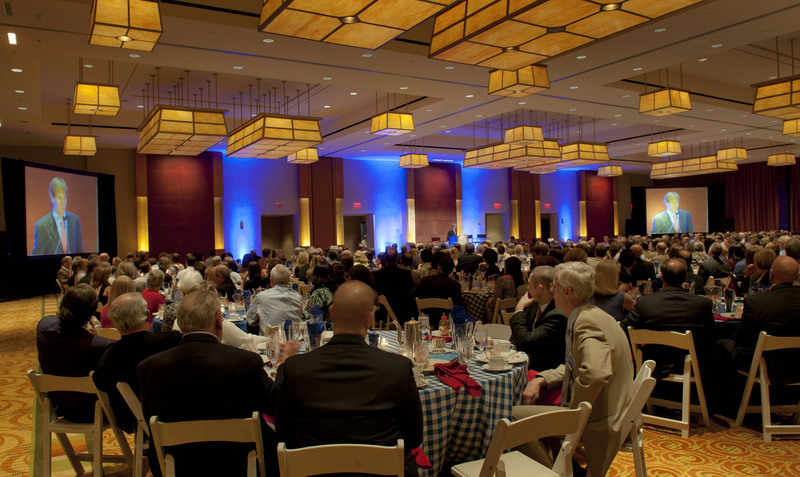 This largest-ever crowd gathered at the annual Heavy Hitter Evening at the Intercontinental Hotel for food, drinks and an inspiring speaking program led by Michael and Dana McCreesh. The McCreeshes founded Team Brentwheels after their young son, Brent, was diagnosed with neuroblastoma, an aggressive cancer. Michael has ridden in the PMC seven times and Dana has been the fundraising powerhouse: today, they lead a team of 54 riders and have raised $5 million for cancer research since 2004. 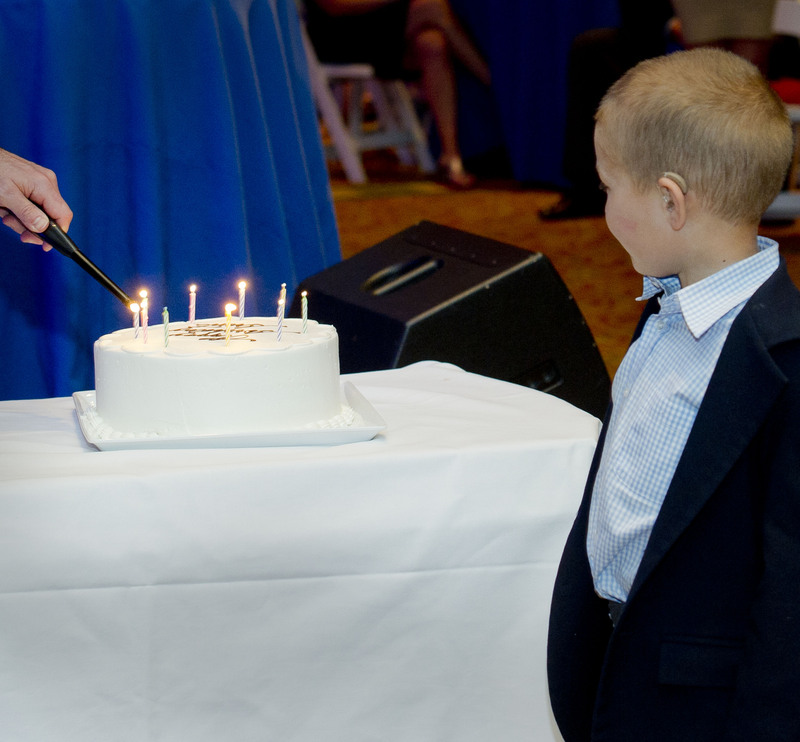 After his parents spoke, Brent took the stage – it was his birthday and the now nine year old blew out the candles on his cake. 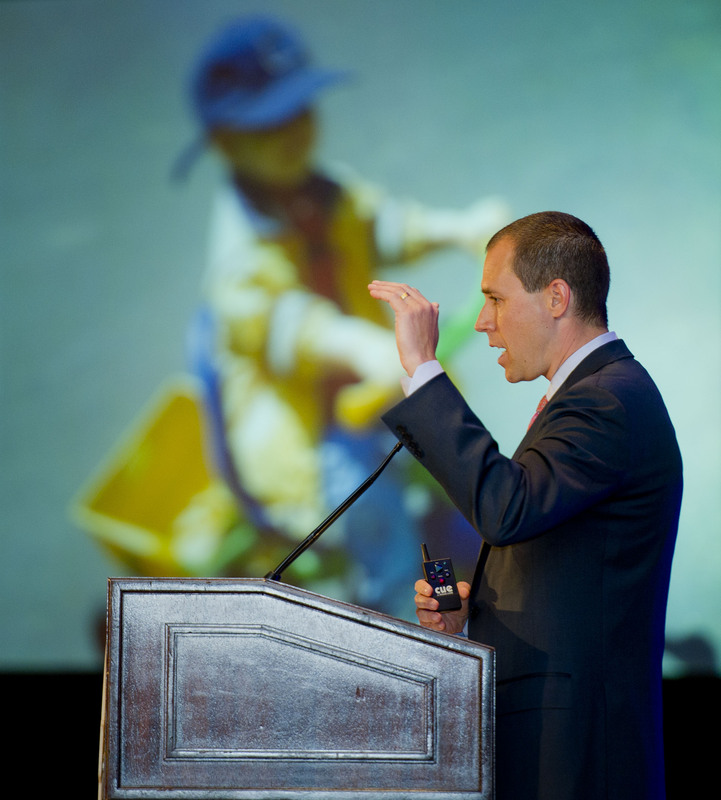 PMC Founder and Executive Director Billy Starr talked about the state of the PMC in 2011. 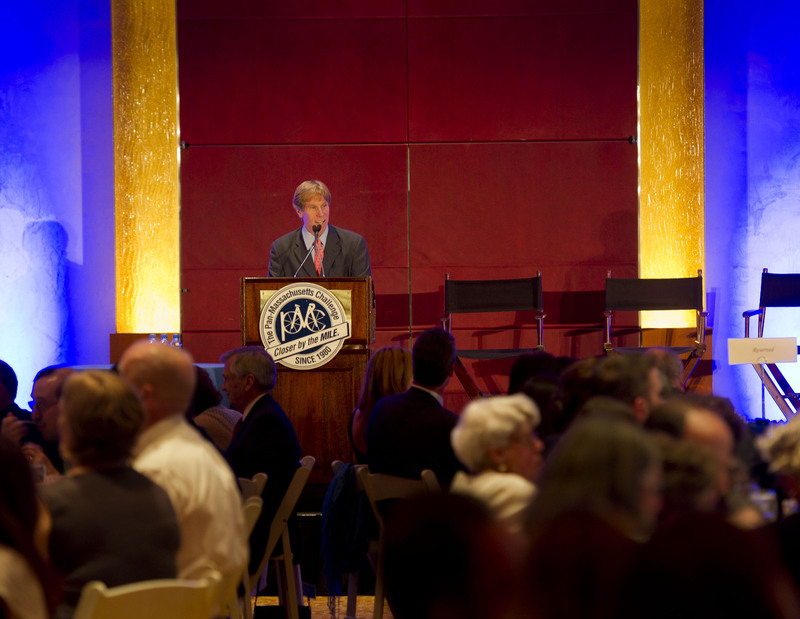 Check out the full event photo gallery here. Learn more about the PMC, register to ride, volunteer or donate here. As I look out at this extraordinary gathering, a record turnout for this event, I know that I am preaching to the choir. You are the PMC’s foundation. And as such, it would probably suffice if I just said, “thank you.” But you won’t get off quite that easy. I do have a few things to share. Upon turning 60 two weeks ago I had an epiphany as to my place in the PMC “peloton”. Once upon a time, I was, at least in PMC terms, of my generation, riding with my generation and, talking ‘bout my generation’. That changed 15 years ago when I slipped past the PMC demarcation line labeled “45” … Age-wise, I am now in the top 7% of registered riders, and the three women who work alongside me in our office weren’t born when the PMC first rode out ofSpringfield,Mass.in September 1980. Luckily, the PMC brings out the best in people of all ages. What we witness along the road is a collective kindness, a genuine love and respect for each other, a feeling of being united in a single goal. We see cancer patients riding along side their doctors, people from all walks of life joined together in aseaofPMCjerseys. The PMC is an oasis of sanity in what is too often a discouraging world. Every year, I am pleasantly surprised by the nature of the PMC crowd and how it differs from other crowds I experience throughout the year. There has been much written about collective wisdom and how group-think can lead to better ideas than when one thinks and works in isolation. Certainly the behavior on PMC weekends attests to, at least, the occasional truth of that notion. If I could sum it up, PMC weekend is unequivocally life-affirming. I can’t think of a better environment in which to be a “human” practitioner. So, my heartfelt thanks to all of you for building that community. The PMC remains the number one athletic fundraising event in the country. Our $33 million donation was $23 million more than the next largest single athletic fundraising event. 60 percent of last year’s donation was raised by the 1,680 heavy hitters – 32 percent of all riders. Volunteerism is up 2 percent. We expect more than 3,000 for PMC weekend. Fundraising is +6 percent; we have just passed $4 million. Corporate underwriting is up as well: in addition to our presenting sponsors – the Red Sox Foundation and New Balance – we say thanks to BMW, MFS Investment Management, and welcome to PricewaterhouseCoopers. Thanks also to Overstock.com and Stop & Shop for co- presenting our Kids Rides program. I will forever be grateful to my friends Phil Balboni and Charlie Kravetz and the entire crew at NECN for 12 years of putting a human face on cancer. But this year, we have a new media partner, WCVB TV and its general manager, Bill Fine. Channel 5 is the #1 news rated station in the greater Boston area so we now have an opportunity to reach 10 times the number of potential riders, volunteers and donors and their #1 anchor, Ed Harding (who is here tonight) will be riding Wellesley-Provincetown. I also want to thank the Boston Globe for placing free ¼, ½ and full page color ads broadcasting our message to its readers. $34 million is a lofty target indeed but I believe we will soon perform at an even higher altitude. On June 1, Trustees, staff and 20+ year riders will gather at the Dana-Farber for a ribbon cutting ceremony for the newPMCPlaza. Together we’ll celebrate the PMC’s lead gift of $183 million of the now-completed $1.2 billion capital campaign. That gift helped build the newYawkeyCenterand funded state-of-the art cancer research and treatment that take place within its walls. We hope to host next year’s Heavy Hitter Evening at this world-class facility. Finally, I need to acknowledge the passing of two wonderful men, two weeks ago, both 76, both of whom battled cancer, both of whom played key roles in the PMC’s evolution: my friends Gordon Young and Sam Zoll. Gordon was the founder of the Seacoast Young Team. In 1992, his leadership and passion helped cultivate an ocean of support in the seaside communities of NH and southern Maine. I felt – as did Chris, Al and Rick who were then all working year-round on the PMC – uplifted and validated by the Seacoast Young team’s all pervasive enthusiasm for everything PMC. His was a special spirit and it will be deeply missed. Sam Zoll referred to himself– in typical self-deprecating fashion– as the PMC’s “consultant without portfolio.” That couldn’t be further from the truth. He rode for 27 straight years beginning in 1984. We met on the ferry home fromProvincetown. He was a big man, 6’5” with eclectically horrible taste in clothing so he commanded quite a presence when he approached me and said: “I am impressed with your work…how might I assist you?” I looked up at him and responded in classic Billy Starr diplomatese; “that depends…who the hell are you?” He mumbled something about having been a city councilor, mayor of Salem and now Chief Justice of the District Courts of MA…I blame my publicist for not briefing me, but I didn’t have a publicist for another 12 years! Nonetheless, I quickly responded: “can you get me into theMassMaritimeAcademy– if you could, I could really grow this event?” He shrugged his shoulders and said he’d look into it. That fall, he persuaded Captain Arthur Desrocher to allow the PMC on campus. But once Captain Desrocher began dealing with me instead of Sam, he quickly regretted his decision. When I would push Arthur’s buttons over the next decade regarding expanding the PMC’s campus imprint – he would vent to Sam about wanting to expel me and the event. Sam would then re-pave the road of good intentions with his velvet tongue. Sam was my mentor. He was always one step ahead of me regarding the special honor and responsibilities that come with my position. I don’t know how I can ever replace his wisdom but hope that his constant counsel to always be prudent and thoughtful has, at the very least, allowed me to approximate his superb judgment. I will be forever indebted to the loving and benevolent blanket he wrapped around me when he co-presided over Meredith’s and my 1991 wedding. Amid all the seriousness of the ceremony – often punctuated with biblical references that so wowed the Catholic contingent that after the ceremony they were referring to him as the “rabbi” — he paused to offer my wife-to-be some of his sagest advice: “Meredith”, he said, “be patient with Billy…” and for 20 years I remind her like a reflexive daily prayer. “My thoughts about the PMC embrace the impact on consciousness raising and the depth of commitment by people from all walks of life who have converted unremitting sadness of personal tragedy into an unsung effort to be part of a hopeful cure. The ride, in its earliest years, was a blend of those whose lives were touched by cancer and those who thought the physical accomplishment of riding two days over 200 miles put them in an elite category. With the passage of time, this blend was sublimated to a uniting sense that miles ridden and personal time records were not what the event was or is all about. The predicate was that the pain of steep hills paled in comparison to the pain that the event was seeking to abate. The numbers grew geometrically and our understanding of the ramifications of the disease became more profound. As immodest as it may sound, each rider and volunteer feels that she or he owns a piece of this progress. Station in life, variances in monetary contribution, differences in personalities and athletic talent have all been made to yield to the commonality of this seriousness of purpose and pursuit of accomplishment. Sam was special and I will miss him terribly. But I believe his spirit resonates within every PMCer in this room. Thank you. Happy Birthday Brent !! I am looking forward to seeing your smiling face at water stop # 4 at the pedal partner tent. Make sure you come find me so we can have our picture taken !! See you in August, Jainey Holland pmc site coordinator Lakeville.